Citric Acid, Natural & Artificial Flavors, Malic Acid, Silicon Dioxide, Calcium Silicate, Sucralose, Acesulfame Potassium, Sunflower Lecithin, FD&C Red Lake #40. Mix each serving (1 scoop) of Cellucor Alpha Amino® in 8-12 fl. oz. of cold water or other beverage of choice daily. DO NOT EXCEED 4 SERVINGS PER DAY. USE ONLY AS DIRECTED. Settling may occur. Natural & Artificial Flavors, Malic Acid, Citric Acid, Sucralose, Acesulfame Potassium, Sunflower Lecithin, FD&C Red #40, FD&C Blue #1. Mix each serving (1 scoop) of Alpha Amino® in 8-12 fl. oz. of cold water, juice or sports drink one to two times daily. For enhanced performance on training days, take two servings before and after training. DO NOT EXCEED 4 SERVINGS PER DAY. Citric Acid, Natural & Artificial Flavors, Malic Acid, Silicon Dioxide, Calcium Silicate, Sucralose, Acesulfame Potassium, Sunflower Lecithin, FD&C Blue Lake #1. Citric Acid, Natural & Artificial Flavors, Sucralose, Acesulfame Potassium, Sunflower Lecithin, FD&C Yellow #5, FD&C Blue #1. Citric Acid, Natural & Artificial Flavors, Malic Acid, Sucralose, Sunflower Lecithin, Acesulfame Potassium, FD&C Red #40, FD&C Blue #1. Citric Acid, Natural & Artificial Flavors, Malic Acid, Sucralose, Natural Vegetable Color (Beet), Acesulfame Potassium, Sunflower Lecithin. Citric Acid, Natural & Artificial Flavors, Malic Acid, Calcium Silicate, Silicon Dioxide, Sucralose, Acesulfame Potassium, Sunflower Lecithin, and FD&C Red Lake #40. Mix one to two scoops of Cellucor Alpha Amino in at least 8 oz. of cold water or other beverage of choice daily. Settling many occur. Malic Acid, Natural & Artificial Flavors, Calcium Silicate, Silicon Dioxide, Sucralose, Acesulfame Potassium, Sunflower Lecithin, and FD&C Red Lake #40. 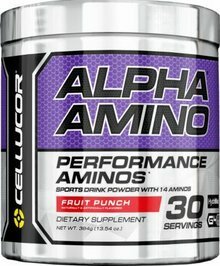 Cellucor Alpha Amino has upgraded its best selling amino supplement for 2016; HydroMax is gone, Betaine is IN, and the BCAAs are transparently dosed! Top of the Line Performance Sports Drink with BCAAs, Amino Acids and Advanced Hydration Compounds.